Norway has few wetlands of considerable size, but some are worth mentioning. In the south, Jæren wetland system is situated on the coast just south of Stavanger. A number of mostly eutrophic lakes in agricultural areas, together with some very good coastal beaches and shallow marine areas, makes this a birders paradise that most Norwegian birders just have to visit a couple of times or more each year. Thousands of waterbirds winter in the area, normally one can find four of five species of geese, Bewick's Swan, Smew, plenty of Great Northern Divers, Red-necked- and Slavonian Grebes, Hen Harriers, Gyrfalcon and White-tailed Eagle just to mention a few. Even in mid-winter one can find more than 100 species in a weekend, which will be very difficult in any other place! In spring thousands of birds use these shallow and very productive lakes as staging areas, and the diversity of wildfowl and shorebirds is impressive. While relatively rare in the rest of the country, Northern Shoveler, Northern Pintail, Garganey and Gadwall kan all be seen quite easily. A trip after dark will more often than not reveal singing Common Quail, Corn Crake, Spotted Crake and Grasshopper Warbler. Reed- and Sedge Warblers are common, and Marsh Harriers are seen most days. Breeding birds include Black-tailed Godwit and Yellow Wagtail of the subspecies flava and flavissima. The potential for rarities is great, some of our last trips have produced Eurasian Spoonbill, Little Egret, Great White Egret, Green-winged Teal, Blue-winged Teal, Ring-billed Gull, Great Reed Warbler and Savi's Warbler, to mention a few of the best. Northeast of Oslo is another wetland of international importance, Nordre Øyeren. Again most important as a staging area for mainly Whooper Swans, dabbling ducks and waders. The number of birds present is highly dependable on the water level, little water expose extensive mudflats that can attract thousands of birds. The inner part of Trondheimsfjorden in the Tröndelag counties has a large number of estuaries and lakes that together form one of the most important staging- and breeding areas for wildfowl and shorebirds in Norway. Large numbers of geese (up to 20.000 Pink-footed Geese) have stopovers here in April and May, and the shorebird diversity is probably comparable to Jæren. 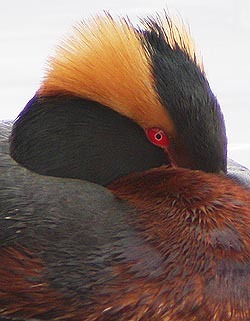 The majority of divers, grebes, wildfowl and shorebirds normally occuring in Norway can be found here in May, of particular interest is the largest breeding population of Slavonian Grebe in Norway, as well as good numbers of Black-throated Divers. In Finnmark, much of the inner regions consist of wast uninhabitet areas, of which a considerable part is bogs and small lakes, with a rich birdlife. Common breeding birds are Willow Grouse, European Golden Plover, Dunlin, Ruff, Whimbrel, Bar-tailed Godwit, Spotted Redshank, Wood Sandpiper, Jack Snipe, Red-necked Phalarope, Short-eared Owl, Long-tailed Skua, Yellow Wagtail (ssp. thunbergi), Bluethroat, Lapland Bunting and Arctic Redpoll. One of our guides, Alf Tore Mjøs, spent seven weeks here in 1992 without meeting any people except two fellow reserchers, so this is perfect for those who want peace and quiet... We strongly recommend visiting this area in the first half og June, after that the mosquitoes can be hard to live with.